Prime Minister Narendra Modi on Sunday called upon states to "speed up capital expenditure and infrastructure creation" to spur economic growth. 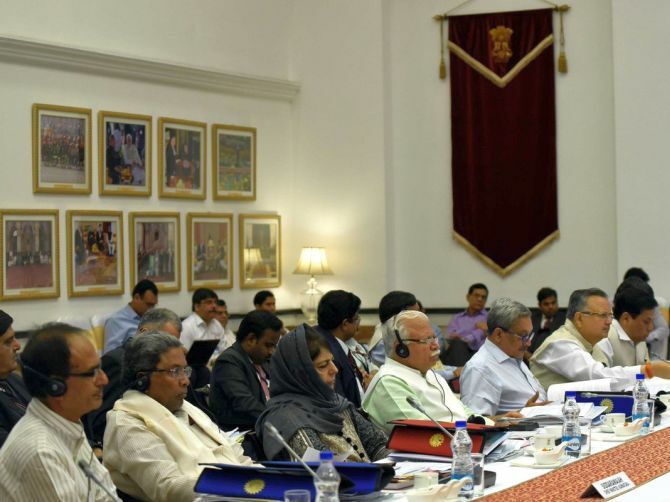 Addressing the third meeting of the Governing Council of Niti Aayog, Modi also said the think-tank's long, medium and short term action plans would benefit all the states. 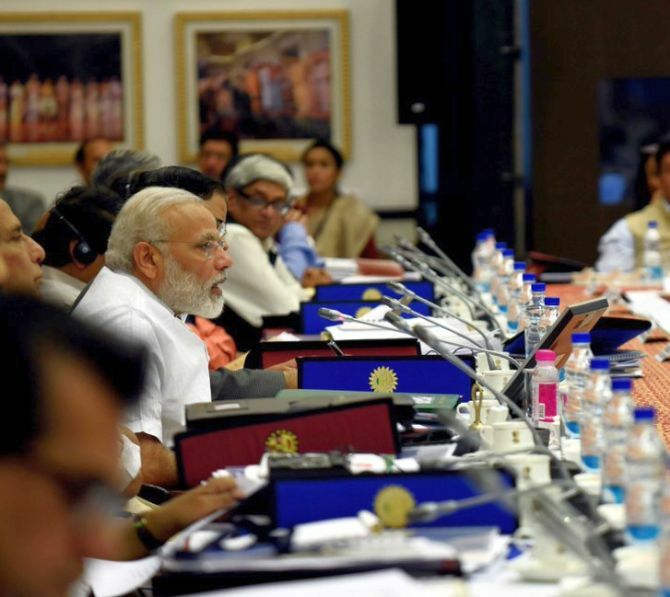 "Niti Aayog is working on a 15-year long term vision, seven-year medium term strategy, and three-year action agenda," he told the meeting, which was attended by chief ministers, union ministers and senior officials. The prime minister further said the vision of 'New India' can only be realised through the combined efforts and cooperation of all the states. "Team India" has assembled here to discuss and reflect on ways to prepare the country for changing global trends, Modi said. It is the collective responsibility of this gathering to envision the India of 2022 -- the 75th anniversary of Independence -- and see how the nation can swiftly move forward to achieve these goals, he added. Observing that Niti Aayog has been taking steps to transform India, the prime minister asked the government, private sector and civil society to work in sync to promote development. The Aayog, he said, is a collaborative federal body whose strength is in its ideas, rather than in administrative or financial control. 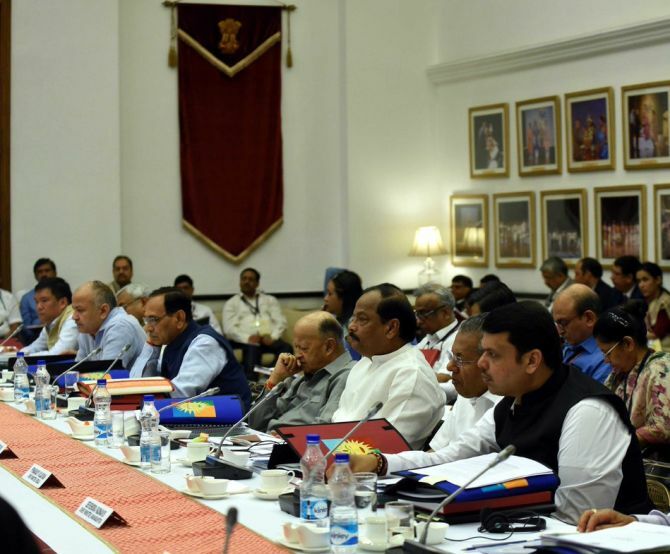 Noting that the chief ministers need not come to Niti for approval of budgets or plans, he said the body had gone beyond relying on government inputs and taken on board a number of outside specialists, experts and young professionals. The states too can contribute to policy formulation, he added. Modi noted that while there has been a 40 per cent increase in overall fund allocation to states between 2014-15 and 2016-17, the percentage of funds tied to Central schemes has declined from 40 per cent to 25 per cent. States need "to speed up capital expenditure and infrastructure creation," he said. Stating that poor infrastructure in the country is ampering economic development, Modi said more expenditure on basic infrastructure such as roads, ports, power and rail would help in accelerating the pace of growth. Referring to the change in budget presentation date, the prime minister said the move enables timely availability of funds at the beginning of the financial year. "Earlier, budgeted scheme funds were generally not approved by Parliament till May, after which they would be communicated to states and ministries. By that time, the monsoon arrived. Hence, the best working season for schemes was typically lost," he added. He said the decision to end the distinction between plan and non-plan expenditure was based on the recommendation of the Rangarajan Committee in 2011. Now "the emphasis would be on distinguishing between development and welfare expenditure on one hand, and administrative overheads on the other," Modi said. Talking about the Goods and Services Tax, he said the consensus on the new indirect tax regime will go down in history as a great illustration of cooperative federalism. "GST reflects the spirit of 'One nation, One aspiration, One determination'," he added. He also called for carrying forward the debate and discussion on simultaneous Central and state elections. The meeting at the Rashtrapati Bhavan is being attended by several chief ministers, including from non-Bharatiya Janata Party ruled states like Punjab Chief Minister Captain Amarinder Singh, Bihar's Nitish Kumar, Tripura's Manik Sarkar and Karnataka's Siddaramaiah. 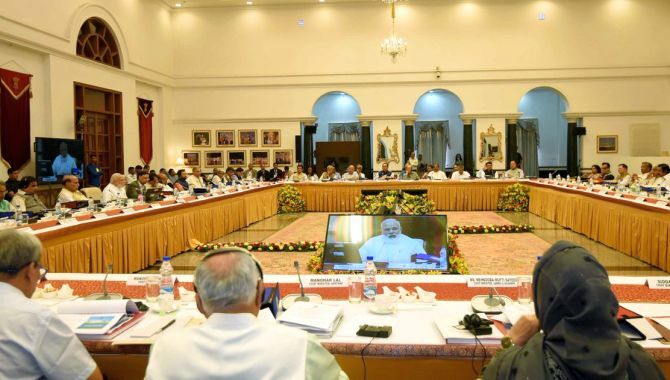 The council, which is the apex body of the Niti Aayog, is headed by the Prime Minister and includes all chief ministers and the think-tank's members. 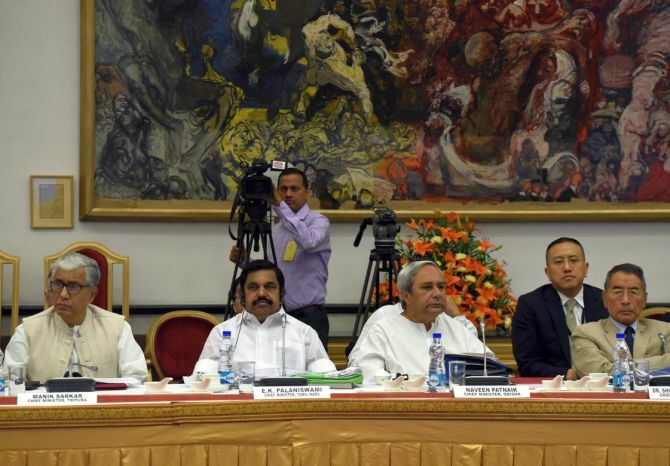 NITI Aayog: A mix of old and new?